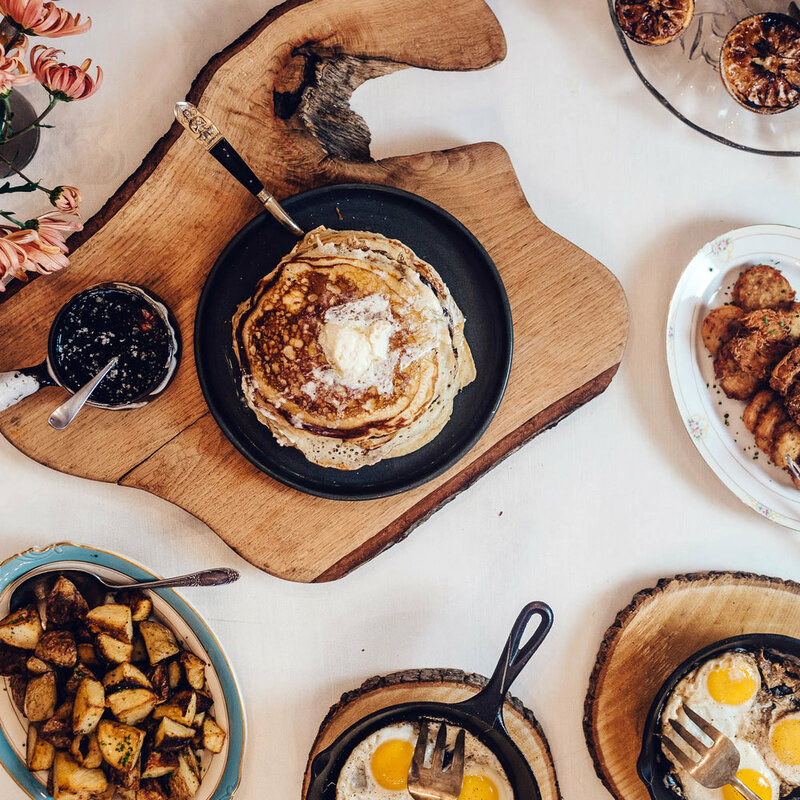 These menus will give you a taste of what we can do, but we’d love to talk about how we can create the perfect menu for your event. Maine lobster meat tossed in warm brown butter vinaigrette and served in a miniature split top Chinese style steamed bun. Yakitori style! Served in the Japanese style, these small skewers are dipped and basted with rich teriyaki and served with appropriate seasoning salt and garnish. Pickled seaweed and tofu in an airy fritter and served with a lemon-tarragon aioli. Fresh Maine Jonah crab meat lightly tossed in a yuzu kosho mayo and served in a miniature split top Chinese style steamed bun. Maine oysters and littlenecks served from our custom shucking station with lemons, cocktail sauce and red wine mignonette. Add-ons: king crab legs, split lobster tails, sea urchin. 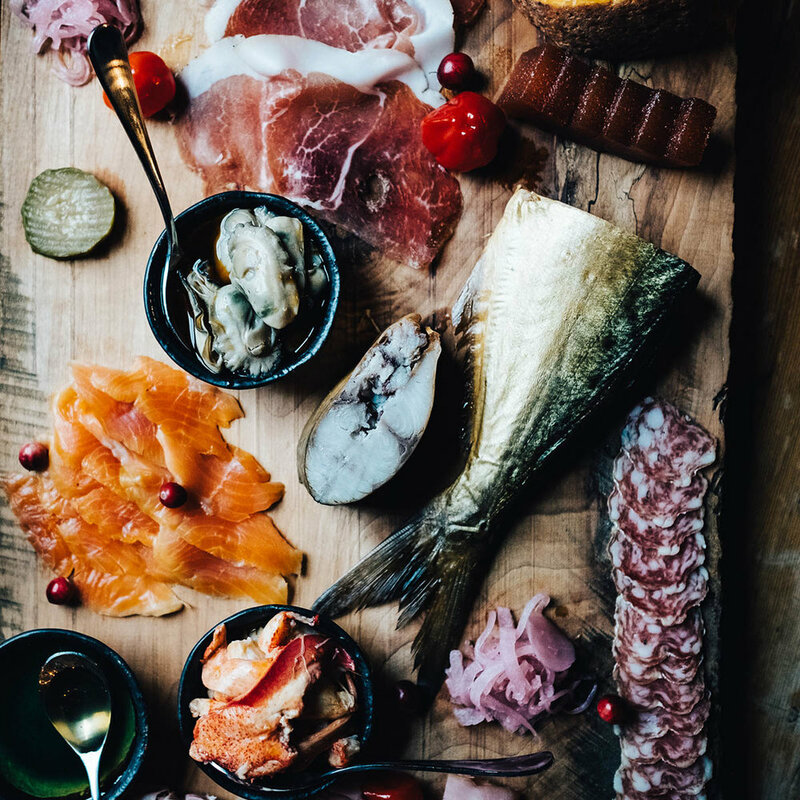 A well curated selection of house made, domestic and imported cured meats that will impress any charcuterie aficionado. Attention will be paid to represent a variety of textures, styles and ages. Accompaniments will include: mustards, compotes, pickles and nuts. Marinated and smoked pork shoulder pulled and ready to make your own lettuce wraps with butter lettuce, smoked oyster emulsion, house sambal, various pickles and an herb salad. Includes: Smashed cucumber salad, kim chee and potato salad. Choose three to four styles from a variety of pies. Our standard pies include: Blueberry lattice, citrus meringue pie with graham cracker crust, bourbon maple pecan, chocolate pecan, chocolate cream pie and blueberry clafoutis. Additional fruit pies will be available depending on season. Please ask what might be available during your event. Chopped sashimi grade tuna dressed with a soy and chili oil vinaigrette and served on ramen crackers with house grown micro greens. Steamer clams, mussels, lobsters, potatoes, salt pork, eggs, corn on cob (in season) served with nori vinaigrette, lemon wedges and drawn butter. Includes: potato chips, biscuits and cole slaw. Like an old school Maine general store! Selections will include whoopie pies, oatmeal cream pies, Fauxtess cupcakes, Allens brandy brownies, cheesecake blondies, coconut ‘snowballs,’ brown butter Twinkies. Grilled kale and cabbage, fried brussels sprouts, radishes, maple walnuts, blue cheese, savory vinaigrette and micro mustard greens. Marinated and confit North Star Farm lamb shoulder. Grilled over coals for a nice char before serving. Grilled whole NY strips, eye of ribs and rib caps from Peppermint Fields Farm in Fryeburg, Maine. Served with our house made steak sauce. Lightly poached Arctic char, served atop seasoned sushi rice with julienned daikon radish, nori strips and a yuzu kosho vinaigrette.